For your convenience, this information on sowing annuals is available as a PDF. Sow What? Annuals! Serious gardeners plant perennials, not annuals, right? Well, yes and no. They plant perennials for beauty that returns from one year to the next, but they also indulge in annuals to bring season-long color to the garden. Annuals fill in bare spaces between newly planted perennials and provide continuous color to augment the shorter bloom-times of most perennials. They supply flowers and foliage for containers, temporary camouflage on fences and arbors, and an unending supply of flowers in cutting gardens. Cosmos (Cosmos bipinnatus, C. sulphureus) – with gracefully filigreed foliage and pert flowers, cosmos belong in every garden. Plants grow from 12 inches to 4 feet tall, depending on the cultivar, so you can find a size suitable to a wide variety of uses and spaces, including containers. Sow seeds in full sun in rows in a cutting garden, in groups or scattered among tall perennials in a border, or in empty spaces in a container after you set in transplants of other annuals. Stake tall cosmos in a cutting garden; in a border, or you can let them bend and drape gracefully in the background. Fertilize once or twice during the season if you cut flowers often for arrangements. 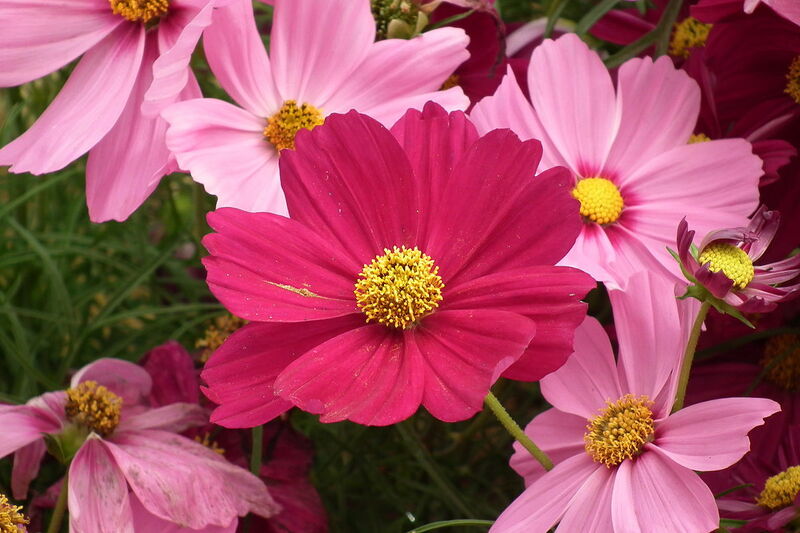 Cosmos is fairly drought-tolerant. Uses and Combinations: In a cutting garden, of course. Mix them with perennials or roses for an old-fashioned cottage garden design. Taller sorts belong at the back of the garden; shorter cosmos make excellent edging plants. Cosmos combine well in containers with lobelia, geraniums, poppies, oxeye or Shasta daisies and blue salvia. Marigold (Tagetes patula, the so-called French marigold) – small-flowered and shorter than the African or American marigolds (T. erecta), French marigolds bear single or double blooms in bright yellow, orange, red, and combinations. Sow seeds thinly and when germinated, space seedlings 6 to 8 inches apart in any good garden soil in full sun. Pinch the growing tips of young plants to encourage bushy, compact growth. French marigolds bloom in 45 to 50 days from sowing; remove faded blooms to promote the production of more flowers. Fertilize midway through the season. 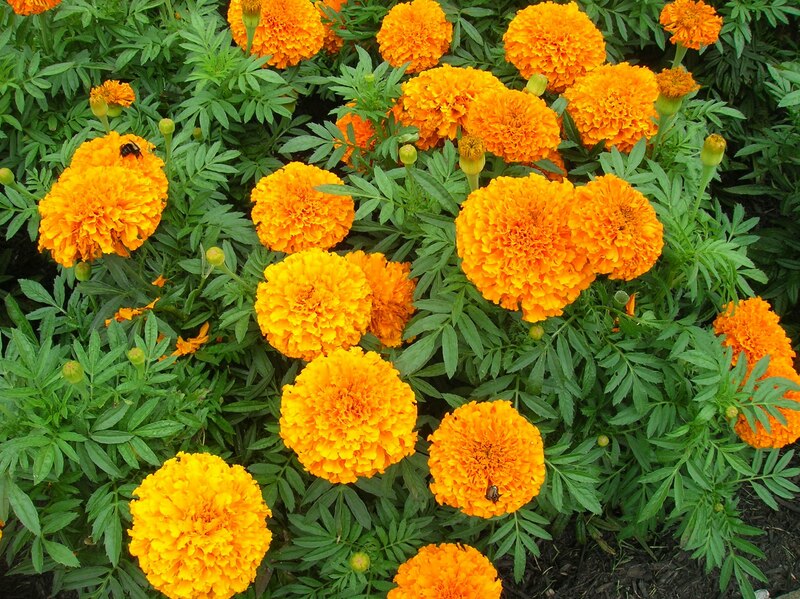 Marigolds are fairly drought tolerant; they need supplemental water only in severe dry spells. Uses and Combinations: Edge beds and borders; they combine particularly well with dwarf daylilies, coreopsis, and yarrow. Plant along with tomatoes in the vegetable garden to repel root nematodes. Grow in containers and window boxes with salvias (red or blue), vinca, and nasturtiums. Morning Glory (Ipomoea nil. I. purpurea [I. tricolor], I. alba) – the twining stems of morning glories cover an arbor or fence with masses of heart-shaped leaves and beautiful flowers, each of which lasts for one day. The range of colors include blue, such as classic ‘Heavenly Blue’, red, pink and lavender, often combined with contrasting or deeper markings. For large, pure white, fragrant blooms, try the morning glory’s relative, moonflower (I. alba), which begins to open at dusk. For best and fastest germination, before sowing seeds outdoors, soak them overnight in a damp paper towel; then, if you want, nick the rounded end lightly with a nail file or scissors. That is the only tricky part to growing morning glories. Use a sturdy support for the plants, which can become quite heavy as they quickly climb skyward to a height of 10 or more feet. You do not need to fertilize or provide extra water during the season. Plants flower in full or part sun. 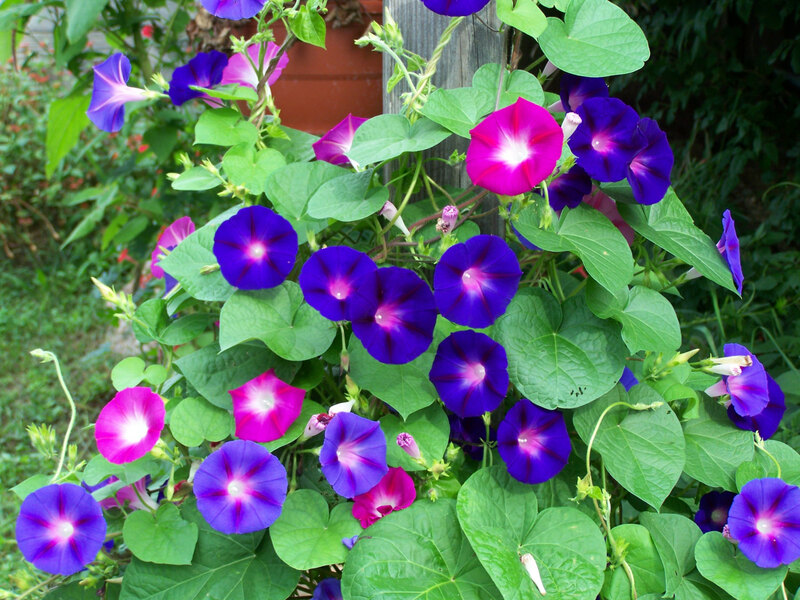 Uses and Combinations: Sow morning glories and moonflowers on the same trellis or arbor for morning to evening color. Camouflage an unattractive cyclone or stockade fence; stems will climb naturally up cyclone fencing; use twine or monofilament fishing line on wooden fences. 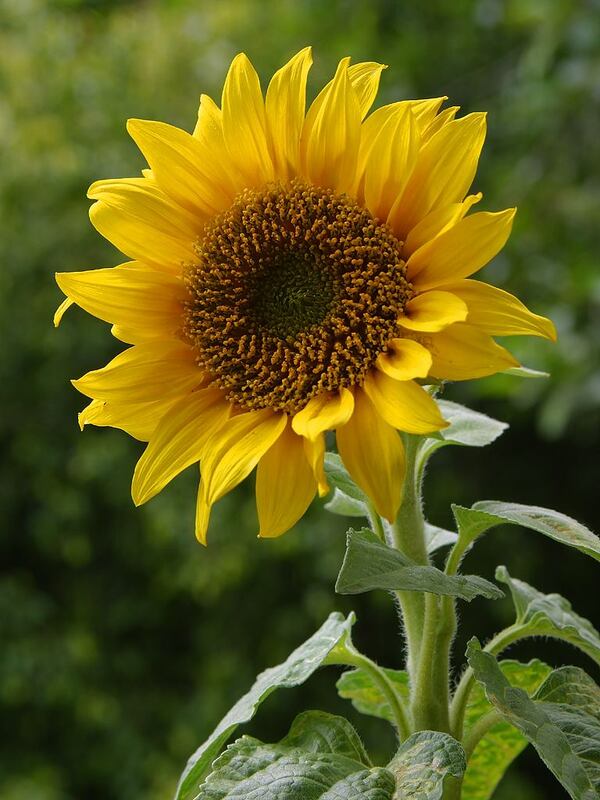 Sunflower (Helianthus annuus and hybrids) – Sunflowers are great fun for kids to plant, and, of course, the birds will love you for providing them with one of their favorite foods. Flowers come in a range of colors, from white and orange to claret-red, bronze, and bicolors. The large seeds are easy to handle; then seedlings to stand 2 to 4 feet apart, depending on the cultivar. Tall sunflowers grow 4 to 6 feet tall; dwarf sunflowers maintain a more manageable height for smaller gardens of 2 to 3 feet. They love heat and tolerate drought. Flower heads turn to follow the arc of the sun. If you want to keep the seeds to feed birds in winter, cover the seed heads with mesh as they ripen. Uses and Combinations: Use at the back of a border, group for a screen or plant as a hedge, or as cut flowers. Dwarf varieties take well to large containers, where they do best on their own, although you can combine them with ornamental grasses, such as pennisetum or blue oat grass, and black-eyed susans and marigolds. Zinnia (Zinnia angustifolia, Z. elegans, and numerous hybrids) – traditional and old-fashioned, zinnias produce flowers nonstop all season. Sow seeds in the border thinly because germination rates are high and plants grow better when not crowded. Fertilize at least once a month and water frequently unless nature provides rain. Avoid getting water on the foliage; that promotes mildew, although many newer hybrids are mildew resistant. Zinnias need a site in full sun, except in the hotter parts of the south and southwest, where they appreciate some midday and late afternoon shade. They are not fussy about soil, as long as it drains well. 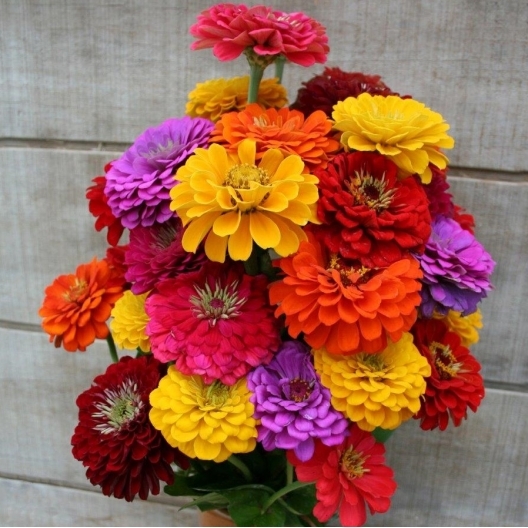 Uses and Combinations: Zinnias practically define “cut flowers” because the more you cut, the more you get from May to frost. Stake tall zinnias in a cutting garden. Use shorter zinnias to edge a bed (‘Profuse White,’ ‘Cherry’ and ‘Orange’ create flower mounds around a garden) and in containers. Combine plants with other annuals such as blue salvia, bachelor’s buttons, marigolds, and silver-leaved dusty miller, as well as perennials from Shasta daisies and helenium to Russian sage, black-eyed susan, and pennisetum. Z. angustifolia makes an excellent ground cover. Fertilize most annuals at least once during the growing season; midway through gives them the boost they need to perform beautifully until frost.